PRODUCT DESCRIPTION: Two styles of Liquid Guards we have available. Though either can be used independent of the other, most applications will benefit if both styles are employed. These are small capsules which are able to hold about 1/2 ounce of urine. They are made from a strong plastic and have an attached cap which can be removed for easy filling. The Capsules are used by placing them in the ground straight down. Make sure they are pushed down far enough so the tops are flush with the ground. Make these placements every 2-4 feet to get thorough coverage. The included Eye Dropper is used to fill each capsule. Once filled, the capsule should be capped. The design of the capsule will allow the urine to slowly "diffuse" out keeping a fresh scent and aroma where placed. This design will release the urine over time yet still protect the contents from rain and sun. WHERE TO USE THEM: Gardens, flowerbeds, walk ways, around pools, along fence lines, under decks, around sheds or your home. 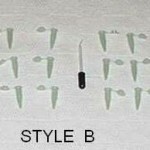 In most cases, a combination of both the larger style and the capsule style will prove to be most effective. However, if you need to make discreet placements, the capsule style will prove to be your best investment. When you need to make larger placements, the larger style guards will serve you better. RATE OF APPLICATION: When using the larger style, fill them with 2-4 ounces and place one every 10 feet. More can be used but 2-4 ounces should last 1-2 months. When using the capsule style, fill them with 1/2 ounce and make placements every 2-4 feet. This will provide 2-3 ounces for every 10 feet so you will have to refill the capsules more frequently. 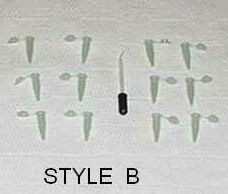 Remember that the use of either style will allow you to get much longer life from urine applications. When urine is placed out on the ground without using guards, it might only last 2-3 weeks. When used with either guard, applications will last 2-3 times as long. Most importantly, placements will slowly dissipate instead of having it all get washed away which can happen when placed out unprotected and there is a heavy rain. Placements in guards can stand up to this weather pattern. No need to worry about attracting other coyote if you use some around your property. Basically the urine scent is used as a marker so if anything, it will let native coyotes (assuming there are any close by) that your yard already belongs to another coyote clan. I just used the button above to add capsule guards to my cart and it worked fine. I did this after adding the Granule/Liquid Guard and when I hit the "view cart" button, I found both were in my cart with no issue. I then used the "update" button to change their respective quantities and had no issues so you should be able to edit the amounts you want once added to your cart. If you are still not able to complete the process, give us a call after we open at 9:00 AM and we'll further assist. The capsules sit well in the soil of the garden and work well to keep rodents out of the garden. The are easy to refill with the included medicine dropper. We've recently moved into a new home that has skunk, possum and a lot of chipmunk activity (lots of holes in the yard and mulch). Will this work to get rid of existing critters or only to repel new ones from coming in the yard? We also have 2 small dogs. Is it safe for them and what is the recommended usage so they won't go by them? Please advise on the best product to use. You really need to remove the chipmunks, skunk and opossum first. Do this with live traps or kill traps. After the property has no activity, you can proceed with urine to prevent new ones from making nests.